Many of the Rubicon Express parts listed have either go way up in price or are no longer available in their original form. As a result the price point of this lift kit is no longer valid. I spent most of the weekend researching all the parts to go into this lift. Many I have done on my own MJ while building it. The intention of this lift is to be entirely complete, have good ride quality, flex well, and require no hacks to install. Most of the parts are bought from RockAuto.com. Suggestions and improvements are welcome! Neat worksheet/project you did there. I would be a bit concerned about using the stock control arms though. Yes they do allow for decent flex, but the flex is obtained by twisting the metal of the arm. Add a bunch more twist caused by the longer springs (and shocks you buy) and I see serious metal fatigue. 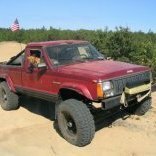 Very nice, This will no doubt be a favorite DIY thread for many new and old comanche owners to come. This will definately be saved onto my desktop :yes: . BTW how long did it take you to compose this lift recipie? research included, not just typing it up. The stress on the stock control arms will be reduced by the fact they are starting at the proper angle. This lift cost is a good starter and then the person can upgrade the control arms later. It was about eight hours of searching CC, NAXJA, and doing cross reference on RockAuto. A lot of time was just spent which sites sold the best product at the best price. Lots of companies make and sell spring perches, but Ruff Stuff has the best at a great price. I need to go back and put in links of where to buy each part. Good solid lift summary Alexis, and fine work as per your usual. :cheers: One minor comment though; M14 (or 9/16" dia depending on the year) fine thread were the factory size used for the non-standard HD U-bolts and long nuts on the MJs w. D44s and the towing package option. This size also does not require drilling out the slotted holes in the spring plates. 5/8" dia. U-bolts are kind of an overkill IMO and are really not needed. 5/8" U-bolts are kind of an overkill IMO and are really not needed. Ruff Stuff's D44 Simple Swap Kit comes with 5/8" bolts which is why I mentioned it in the document. My updated version I am working on has part numbers for that kit. The nice part about going to 5/8" is that since they can be torqued to over 200 foot pounds it is unlikely they will ever stretch making them much more friendly for retorquing in the future. Great write up. I will definitely be using this as a reference. Where did u find RE coil springs that cheap for both? The cheapest i have found was 175 for a pair. Just curious, has this lift kit setup been finalized? All the details been ironed out? Pretty much finalized. I do not have the engine and transmission in the truck yet so the front end is sitting ridiculously high. The price of this lift might go up just a little if front spring spacers or 6.5" springs are required. Actually, I just added links in to buy the pieces where I found them and some extra information. 6.5? I thought this was a lift for 5.5? Yes, it is, but depending on which rear leaf springs are in your MJ you may end up with effectively 6.5" of lift in the rear. Such as the Metric/Big Ton leaf springs. Ooohh, right. So I have an eliminator, not sure if it has the offroad package, but if i were to do this i think i would net 5.5, 5.7 something like that. Stock MJ arms were never meant to control gigantic tires. Isnt there some grinding required for that?